A field of seven runners went to post for this recognised trial for next month’s Investec Oaks at Epsom, with Highgarden the 5-2 favourite to provide trainer John Gosden with a fourth successive win in the race – and a sixth in eight years. Frankie Dettori took the market leader to the lead from the start, but she was a spent force entering the final furlong, whereas the William Haggas-trained Give And Take battled it out with Dancing Brave Bear on the stands’ rail. Ridden by James Doyle, Give And Take asserted close home to secure victory by a length. Doyle said: “I was pleased with her. Each time she’s ran to a creditable level. Haggas added: “I was delighted with her. She’s a stakes winner for the breeder. “I’ve never been convinced a mile and a half is her go. 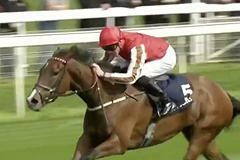 Nicholas Jones (owner-breeder) assures me she’s from a good staying family, but she has always shown me speed at home. Haggas said: “I wasn’t expecting James to ride her like that, just because we knew she’d be a strong stayer, but I left it up to him. “I don’t know about Epsom, I’ll have to talk to her owner/breeder. He’s adamant she’ll stay further and I’m not so sure. “She was a bit exposed by Sir Michael Stoute’s filly (Crystal Hope) at Sandown, but we did have a penalty, and now we’ve won a Group Three. Ed Vaughan said of runner-up Dancing Brave Bear: “She just didn’t come forward from her last run as I would have liked. “She’s only really come to herself in the last couple of weeks and she’s given a good blow there so I’m sure there’s improvement in her. The Musidora Stakes is named after Musidora, the Yorkshire-trained winner of the 1,000 Guineas and Oaks in 1949. Established in 1961, it serves as a leading trial for the Oaks. The first running was won by Ambergris. The present race grading system was introduced in 1971, and the Musidora Stakes was given Group 3 status. In total, six winners of the race have achieved victory in the Oaks. The first was Noblesse in 1963, and the most recent was Sariska in 2009. The Musidora Stakes is currently held on the opening day of York's three-day Dante Festival meeting. It is run the day before the Dante Stakes.